From left to right : Mr. Gaétan Barrette, Health and Social Services Minister, Mrs. Martine Alfonso, MUHC’s Interim President and Executive Director, Mrs. Martine Turcotte, Bell’s Vice Chair Québec , Dr. Michaela Barbarosie, Director of the Neuromodulation Unit at the MGH and Mr. Jean-Guy Gourdeau, President & CEO, Montreal General Hospital Foundation. 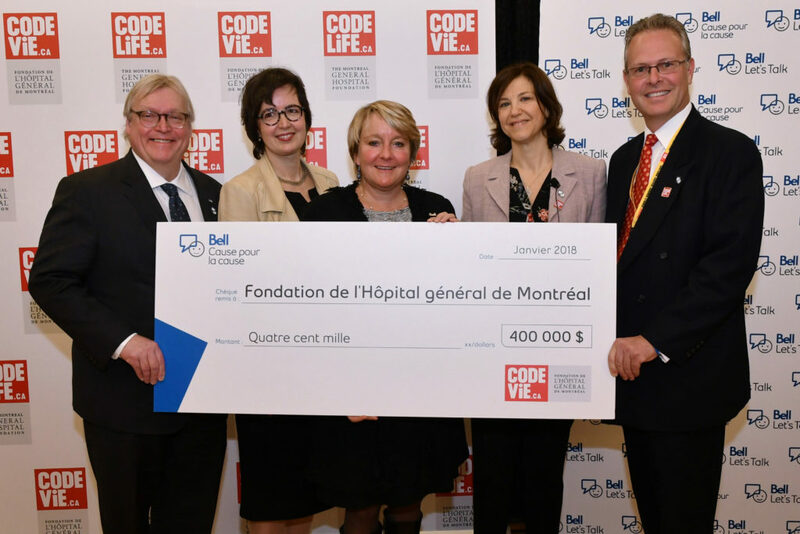 Bell Let’s Talk today announced a donation of $400,000 to the Montreal General Hospital Foundation (MGHF) to acquire a new repetitive Transcranial Magnetic Stimulation (rTMS) device and a neuronavigator. These devices will help McGill University Health Centre’s (MUHC) Mental Health Mission increase access to its Neuromodulation Unit for people living with mental health issues. Health and Social Services Minister Dr. Gaétan Barrette joined Bell’s Vice Chair Québec Martine Turcotte; Jean‑Guy Gourdeau, President and CEO of the MGHF; and Martine Alfonso, MUHC’s Interim President and Executive Director, to make the announcement. rTMS therapy is offered to patients with mood and anxiety disorders for whom medication is not an option. These safe, non-invasive treatments involve a magnetic field focused on specific areas of the brain. Depending on the patient, this treatment either strengthens or weakens the neural connections associated with the patient’s disorder, with little or no discomfort. The new neuronavigator uses the patient’s brain images, obtained through magnetic resonance imaging (MRI), to more precisely target the rTMS therapy, improving its therapeutic performance, with better remission and treatment response rates. This will have the added benefit of increasing the number of patients treated each year. Bell Let’s Talk Day 2017 set all new records with 131,705,010 messages, growing Bell’s funding for Canadian mental health by $6,585,250.50. #BellLetsTalk was Canada’s top hashtag in 2017, and is now the most used Twitter hashtag ever in Canada. With approximately 729,065,654 interactions by Canadians over the last 7 Bell Let’s Talk Days, Bell’s total commitment to mental health, including an original $50-million anchor donation in 2010, has risen to $86,504,429.05. Bell expects its donation commitment to reach at least $100 million in 2020. To learn more, please visit Bell.ca/LetsTalk. The Montreal General Hospital Foundation’s mission is to provide vital support for vital care. The Foundation is mandated to raise money, manage significant funds, and invest responsibly in healthcare research, training and technology at the Montreal General Hospital (MGH), the McGill University Health Centre (MUHC) and more broadly, within the McGill academic health network. We work in close partnership with donors and dedicated collaborators to raise awareness and foster excellence in vital care to all patients, present and future. Official donation announcement from Bell Let’s Talk to the Montreal General Hospital Foundation in support of the MUHC Neuromodulation Unit.